One of the favorite pastimes “real travelers” is put constantly in search of the most desired destinations for program the coveted summer vacation and do not … the fearless heart of the globetrotters always beats inside many of us and never miss a beat! A beach holiday in Greece certainly could not deface in your list: its coast and its islands are perfect to organize a trip in the warmer months, but also to enjoy a nice break in the middle of those spring. Do not think, though, to Greece only considering popular Cycladic islands like Mykonos, the most popular, or the Sporades, with Skiathos which is the master, I assure you that Rhodes, Crete, Corfu and the mainland will soon make you think again; In fact, as we shall see now, that’s where you’ll find many of the most beautiful beaches of this magnificent country! 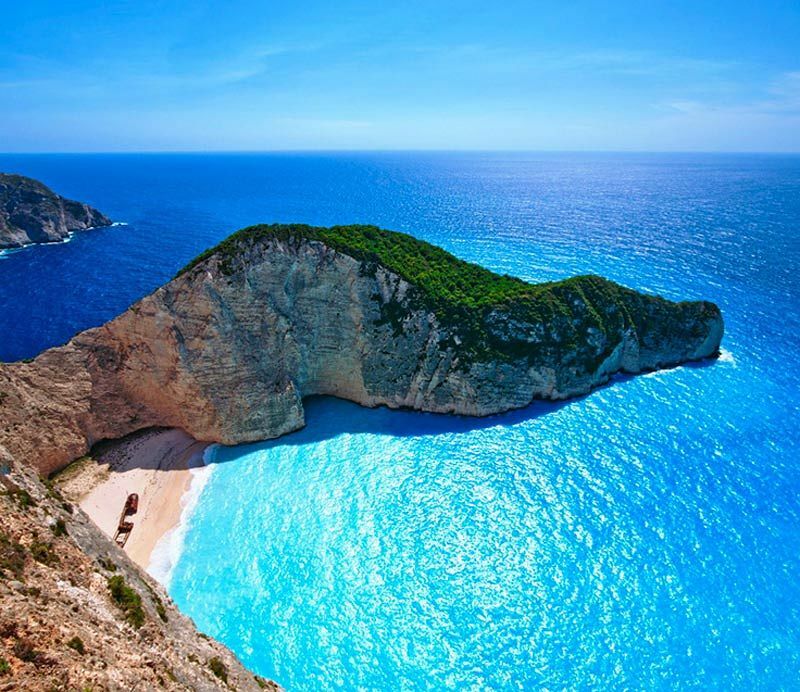 The Shipwreck Beach (Navagio in greek) or rather the wreck is a remote bay on the island of Zakynthos. In 1980, a ship of smugglers sailed from the coast of Turkey with a cargo destined for the black market was suddenly taken over by the Coast Guard and, given the adverse weather conditions, she decided to take shelter at night in the vicinity of this cove. The next morning, the merchant was stranded in a shoal. Over the years the surf created from the wreck of the ship meant that it formed a beautiful white beach; Wreck of the beach, in fact, now has become a very popular tourist destination. Set among the rocks on the reef, this beach, which has a sandy expanse with a sea of blue almost embarrassing, is reachable only by boat set sail from the port of Vromi with local boats leaving every hour. Do not miss if you love beautiful scenery, even the unforgettable view from the bay that you can enjoy taking a paved road leading to a parking lot between the countries of Anafonitria and Volimes. It features a superb roof terrace suspended in space that will allow you to make one of the most beautiful photographs that you could ever imagine. What I was saying of Crete? 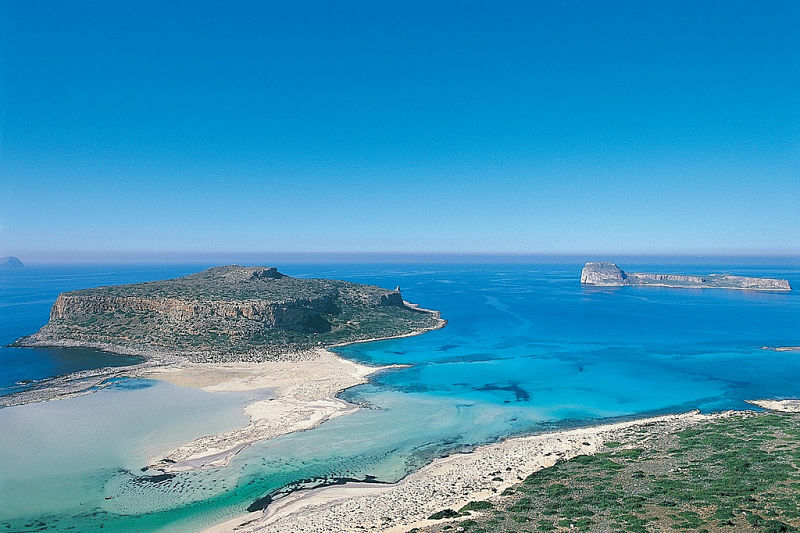 In the western part of the island, about 45 kilometers west of the city of Hania, between Cape Gramvousa and Cape Tigani, there is the beautiful lagoon of Balos, certainly one of the must-see places of Crete. This lagoon is a real enchanted place: protected area for several years when nesting cormorants and sea hawks, in its waters you can even meet, at times, loggerhead turtles and monk seals. Its sand, very white base, in some places becomes almost a pink coral and the sea, always warm and calm, for a long stretch does not exceed the depth of one meter; It is making it ideal for our children to swim in the utmost tranquility. Beyond the rocks, however, about ten meters from the coast, the waters become deeper offering snorkelers myriad fish to be admired. This place is accessible by car, through a dirt road that runs for about 10 kilometers from Cape Gramvousa, leaving the car in a parking lot and then choosing a trail even by children, or by sea with ferries leaving from the port of Kissamos (about 22 euro). Balos Lagoon, with the sea in the tropical hues, the wildlife and the fine sand offers certainly one of the best shows you can see in Greece! When Lord Byron likened the beauty of Cape Drastis to the white cliffs of Dover, it was not really a point … These massive cliffs are very reminiscent of the landscapes of Cornwall! 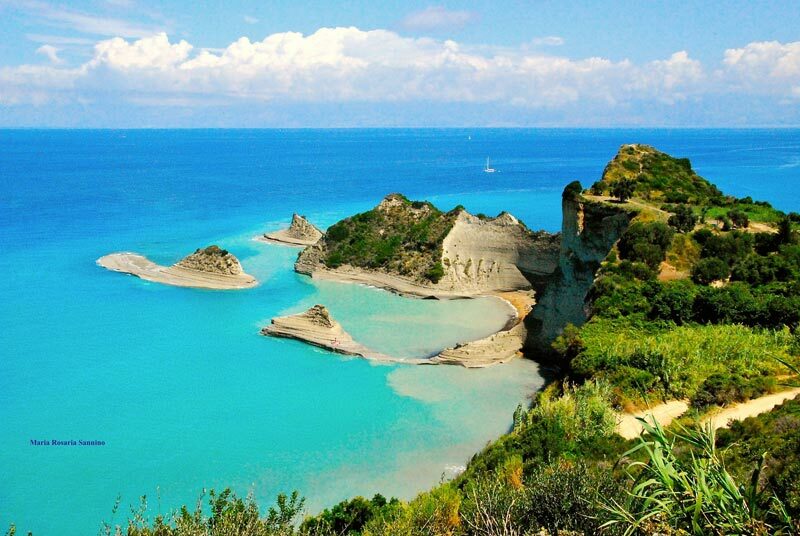 Near the village of Sidari, north-west of the island of Corfu, there is this beautiful rocky area, an inlet formed by rock smoothed by the wind that ends overlooking the sea. 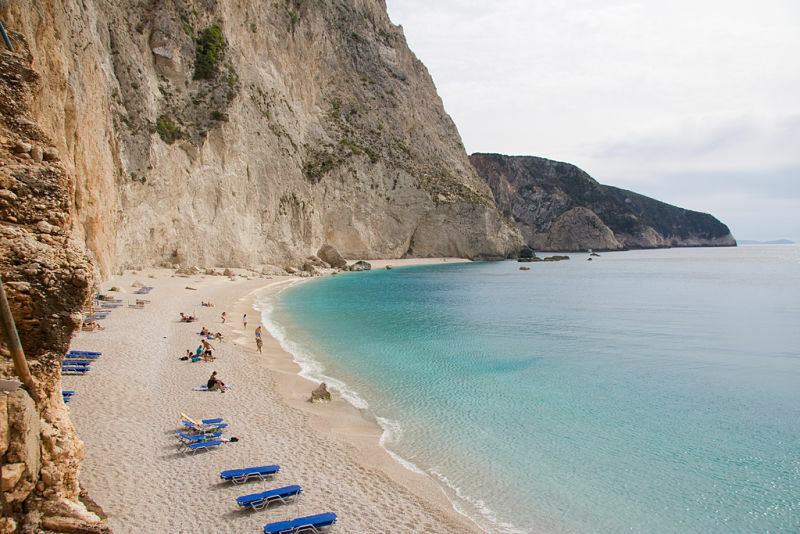 Full of small coves of white stones that follow one after the other, accessible by rental boats or through a parking area going from a hill, the Cape Dristis area has a small beach nestled between the cliffs that plunge into the sea. Few tourists, no type of equipment; This small stretch of sand mixed with pebbles offers the wildest may be present in the natural panorama. Ill-suited to families with children because the seabed often has sharp rocks, it is the ideal place to spend a few hours in complete relaxation, perhaps taking advantage of the many ledges for spectacular dives. I must warn you that, precisely because of the rocky bottom, you have to be very careful and leave the water clinging to the many strings to avoid making big slips; However, for those who like to discover hidden coves, Cape Drastis is a real amusement park as well as one of the most beautiful beaches in Corfu! 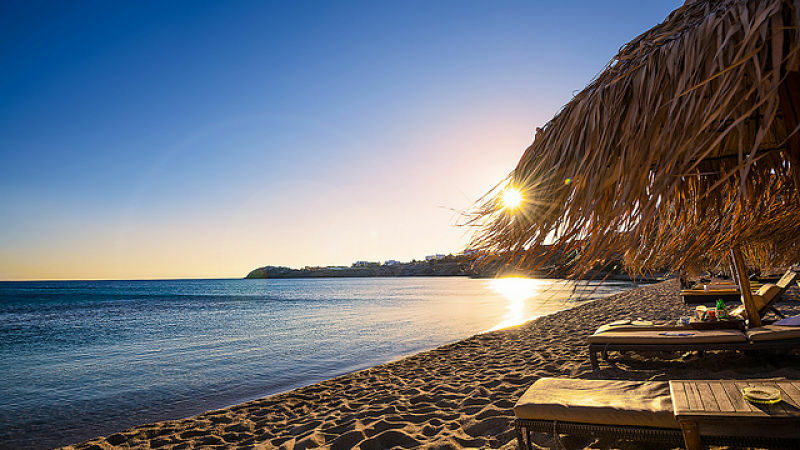 It is certainly very difficult to find words to describe the area of Elafonisi, one of the best beaches in Crete: pristine sand, shallow water and very calm in perfect tropical style, this is the reality disarming before which you will find yourself just arrived in this wonderful place! Elafonissi, also known as “the Caribbean of the Mediterranean”, in reality it is much more than a beach: the magnificent expanse of sand, in fact, is also connected to a small island of sand dunes dotted with sea lilies and small bushes. It is joined to the mainland by about 200 meters of sandy passage, depending on the tides, it is covered by water … A real paradise on earth! 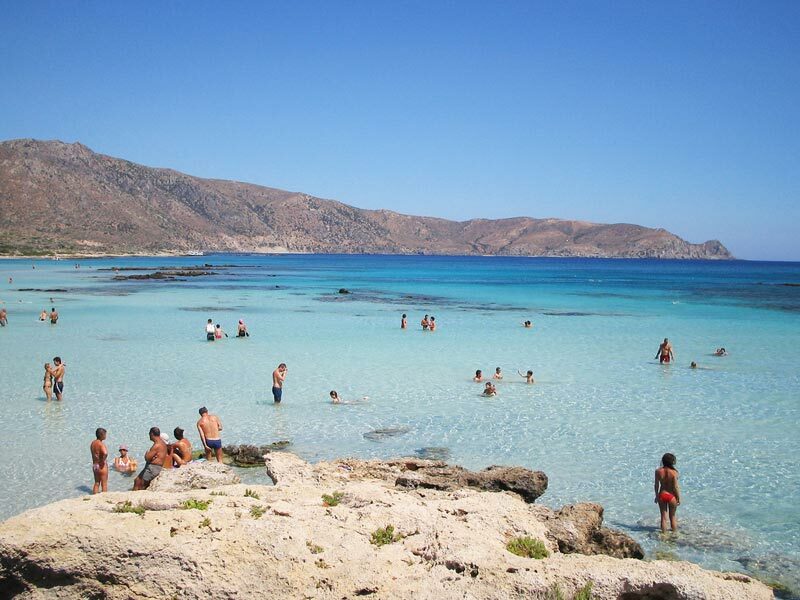 Also for this reason, Elafonissi, located about 75 km from Hania and reached by a car trip lasting about an hour and a half crossing points undoubtedly tortuous but fascinating as the beautiful White Mountains, it is certainly the best beach Crete’s beautiful. The beach is equipped with umbrellas and sunbeds, also point out the presence of a bar where you can eat something; it is also even this, a protected place because of nesting loggerhead turtles. I highly recommend to be able to stop for the sunset, with the sun catching the waters of the lagoon giving unimaginable colors. If you have a bit ‘of time, you can also visit the nearby monastery of Chrissoskalitissa where, as legend has it, a step of gold will appear to the pure spirit… So, why not try? With an area of about 1400 km, Rhodes is the largest island of the Dodecanese. 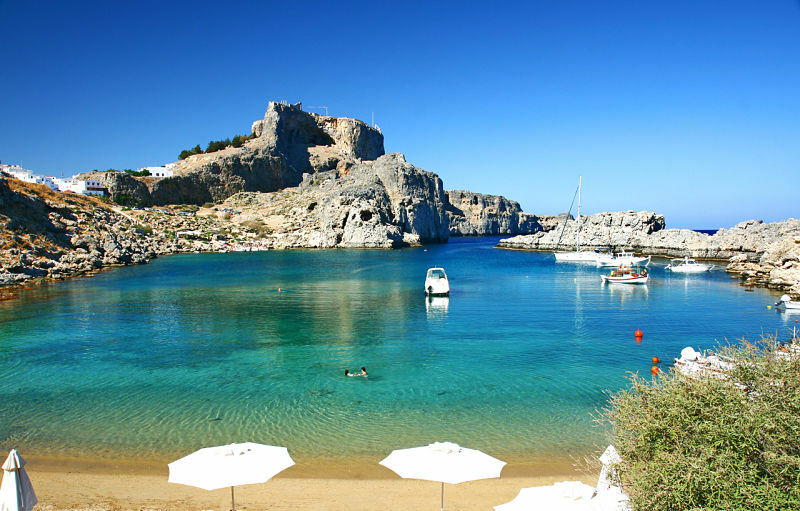 Thanks to its mild climate, this island can be visited throughout the year and this definitely is a big point in its favor … Lindos is a small town situated along the eastern coast about 55 kilometers south of Rhodes. A UNESCO World Heritage Site, with its white houses and the paved courtyards of the mosaic, this beautiful location is a real acropolis in the open, open only on foot or on the back of a mule. Its beach is one of the most sought after and is always present in the rankings of the most beautiful beach resorts in Greece. Composed of small pebbles, not large, equipped with bar, toilets, sunbeds and umbrellas, looks like a small umbilicus, on the edge of the village. Note, on both sides of the bay, a restaurant cooking delicious dishes and a small church dedicated to St. Paul, built on the site where tradition says that the Saint is joined on his journey from Antioch to Rome. If you love culture, After freshening up in these beautiful waters, you should visit the Acropolis and the Castle of the Knights of Rhodes. Do not miss when the sun sets and illuminates the entire landscape by turning on the magic of the past. St. Paul’s Bay is one of the most favorite beaches for tourists from all over Europe. 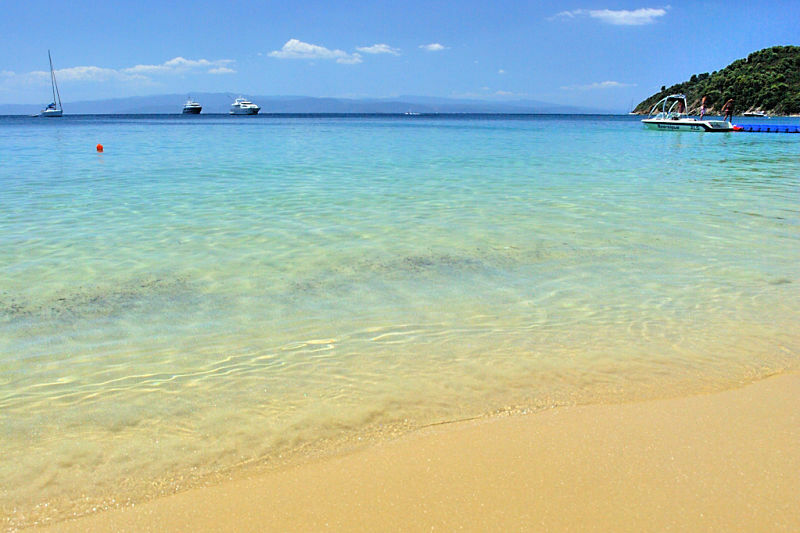 We are now in Skiathos, one of the most visited destinations in Greece. 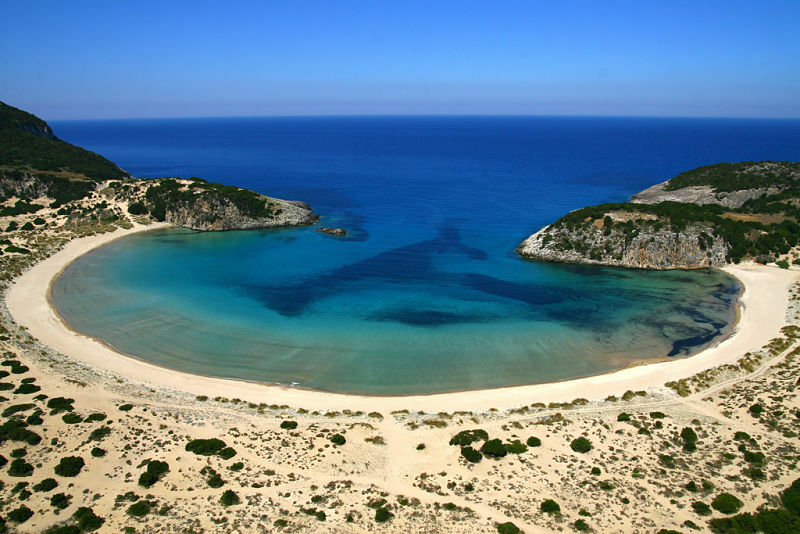 Koukounaries Bay is the most famous beach of the island, for many also the most beautiful. It looks like a long stretch of golden sand lapped by fig trees and pine trees that offer refreshing with natural shadow to all the tourists who want to visit it. Frequented by children and families, this beach is easily accessible by bus which runs every 30 minutes congiungendola with Skiathos main town, which is about six kilometers (4 Euros round trip). Surrounded by a thick pine forest, it is considered one of the wildest beaches on the island. Behind this beautiful very fine strip of sand nest many species of birds and grow various plants with distinct shapes, enough to make this day a protected environment. Koukounaries has a variety of services: you can count many establishments equipped with wooden cabins, free wi-fi, sun beds and umbrellas at a very affordable cost, toilets, showers and various bars and taverns where you can have a delicious meal at a modest price. As happens in most of the busiest beaches of the Greek islands, throughout the day you will be kidnapped by a rousing music that will also be accompanying the many water sports that you will experience on this fantastic beach. The road winds through a path that starts from Lefkada Town and crosses the mountains to reach, after about forty kilometers, a car park near the stairs. You can also arrive by sea, thanks to the taxi boats that depart from the villages of Vassiliki and Nidri. The beach stretches out under a long cliff several hundred meters, the sea is a beautiful turquoise color that turns into a deep blue and the sand layers alternating fine to small areas of rocks. In its surroundings you can find several snack bars and even a rooftop restaurant where you can sample the local specialties while enjoying the view nothing short of breathtaking! Porto Katsiki is undoubtedly one of the most beautiful beaches in Greece; This is why I highly recommend, to appreciate all its beauty, not to attend it in the months of July and August when the overcrowding would lose part of its charm. Red Beach is a spectacular and fascinating expanse of red sand, near the village of Akrotiri, in the south-west of the island of Santorini, one of the most famous in Greece. 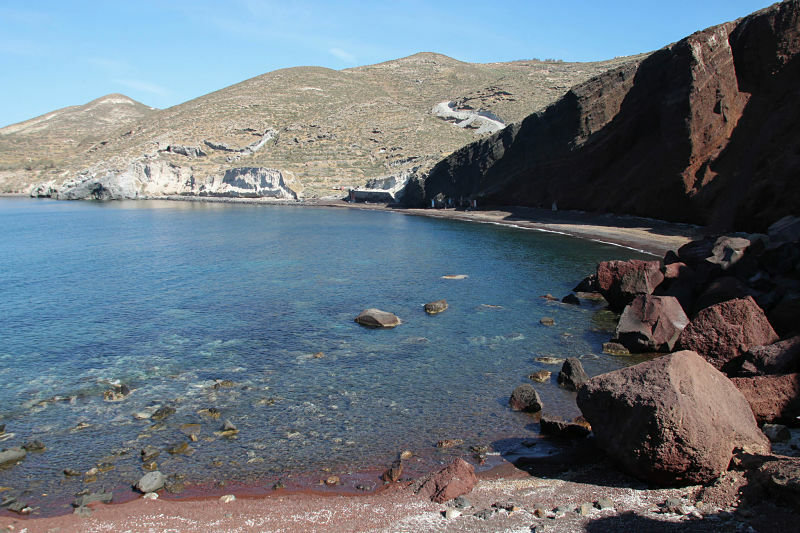 This beautiful beach made up of red and black volcanic sand mixed is enclosed by bluffs of the same color and is a few kilometers from the archaeological site of the ancient city of Minoan. Here, between legend and reality, there is often talk of the similarities between this beautiful island and the famous city of Atlantis as described by Plato and the charm of this enchanted place will never end. The famous red beach is reached by following a natural road that leads to a parking lot where there is a bar and some stall; from here you have to walk for a hundred meters on the reef, so I highly recommend you obtain a nice pair of shoes to better address the way. On the beach there are no services, and given the location not too easy to get there, it is also very difficult to bring beach chairs and umbrellas, but the show that will open before your eyes will have no equal: a beach sheltered from the winds of a color of a beauty almost disarming! Ideal for all who love snorkeling, mainly thanks to special color of its rocks, Red Beach has many admirers around the world. Council to visit, a few steps from the beach, even the chapel of St. Nicholas at the foot of the volcanic landscape of Mavro Rachidi: a spectacle not to be missed! 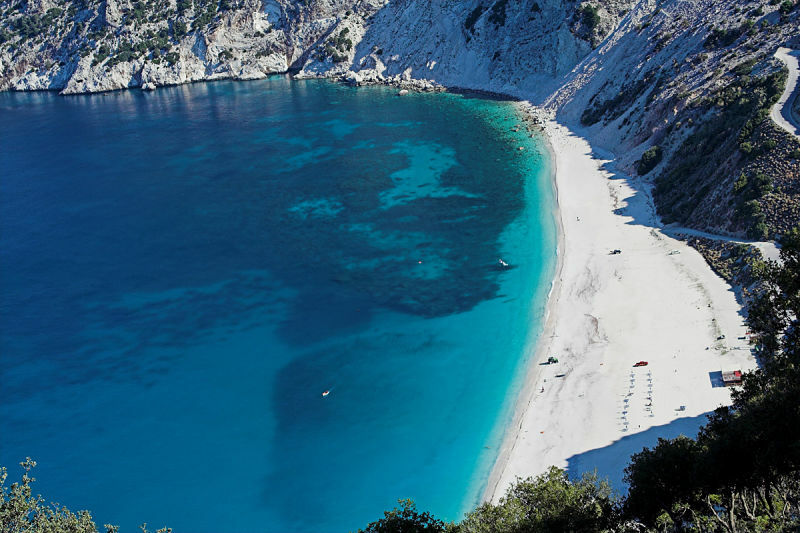 I do not know what is necessary to present this beach as a figure at the top of the most beautiful resorts in Greece and is present on the tourist guides around the world who speak of Kefalonia. Every year, in fact, Myrtos Beach, which is 3 kilometers away from the village of Divarata and 30 from Argostoli, receives the assigned Blue Flag dall’EOT (Greek Tourist Organization). The view from the top of the cliff is really impressive: a huge white pebble beach enclosed by rocks dotted by green bushes and bordered by the sea of dazzling blue, a landscape that certainly turns heads. Myrtos Beach is equipped with all the comforts that the most demanding tourist can require: from beds to canopy beach until sailing lessons. Part of the beach is free to enjoy the peace of mind if you seek, however, peace and relaxation. The sea slopes down almost immediately, so it is definitely suitable for those who are lovers of the beautiful swimming and hiking and snorkeling. On the left side of the beach there is also the possibility of entering a cave and dive in its crystal clear waters, hike certainly not to be missed if you are in search of adventure. Voidokilia, a strange, beautiful beach sheltered by many dunes, it is the place where legend has it that the meeting took place between Telemachus in search of Odysseus, and Nestor. According to many historians, this location may be the one that defines Piro Homer in fact, close to the beach you will find Nestor’s cave, while the north eastern end of the grave of his son Thrasymedes. A place of great charm where the beauty of the golden sandy beach and crystal clear waters are interwoven with the enchanting atmosphere of the historic ruins that testify everywhere the glorious past of this beautiful land. This spectacular beach is now a protected area about ten kilometers from the town of Pylos and can be reached past the town of Petrocori north of the Navarino Bay. Its protected bay encloses a beautiful fine sand strip; there are no eateries so I suggest you arrive well equipped to get through the day. If you love nature, this beach you can go through a nature trail on the Gialova lagoon where you will have the chance to see wonderful birds that nest in absolute tranquility. If you’ve been to Mykonos you can not not know these two beaches and if you’ve never been you should definitely see them! I have purposely left this island for the last several years because they are being chosen by tourists from around the world as the “Queen of Greece” for its high tourist numbers. The white of its houses which is reflected in the intense blue of the sea is present in hundreds of depictions representing Greece and often is used just as a symbol of this wonderful territory. Paradise Beach and Super Paradise are considered the two most beautiful beaches of Mykonos, which still has several facets on every side, maybe that’s why it’s also the most beloved. Appartarvi if you want to enjoy peace and relaxation, in the eastern part of the island you will find the beaches of Elia and Agrari they will do for you, here (right side) is even allowed nudism. If desired, however, enjoy natural pools ideal to bathe the children then the Paraga Beach on the south side it is definitely right for you, but if you want sunset “unleash hell” then Paradise and Super Paradise are what look. In these two fine sandy beaches the key word is FUN! Not surprisingly, the majority of the most famous resort of Mykonos is located in their vicinity. The day on the beach flits between a swim and a water sport, but it is the night that these two beaches give the best of themselves! 7 days 7, 24, 24 hours of frantic rhythm music capable to wear down the most hardened fan of nightclubs on the island! The Beach Party that are renewed by the hour will certainly not leave indifferent those who love the nightlife, certainly are spoiled in their teeth! In short, concluding our journey you will have noticed that Greece is definitely a destination suitable for all needs. Whether you are nature lovers, photographers who love the views, people who prefer to bask in the sun expanses of fine sand, some individuals’ mavericks or more subjects unbridled worldliness lovers, I think you can put this country among the destinations on top of your wishes for the upcoming holidays … I assure you that you will not regret!